The Championship club is providing a place to sleep, hot food and drinks. 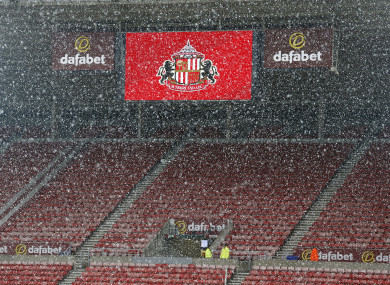 Snow falls at the Stadium of Light (file photo). STORM EMMA HAS hit this part of the world hard over the past few days, and the lives of those unfortunate enough to be living on the streets are in serious danger due to freezing temperature and heavy snowfall. With that in mind, Sunderland Football Club has opened its doors to help provide shelter for the homeless in the area. At the Black Cats’ home ground, the Stadium of Light, a warm environment has been set up with somewhere to sleep, hot food and drinks on offer for anyone in need. In a statement, the Championship outfit has said the room will remain open until at least Monday morning, weather dependent, while pets are also welcome. For a club that has attracted plenty of negative media coverage in recent years, it’s a fine gesture. Email “Sunderland opens the Stadium of Light up for homeless in need of shelter from Storm Emma”. Feedback on “Sunderland opens the Stadium of Light up for homeless in need of shelter from Storm Emma”.